Police have released a video of a high-speed car pursuit of a stolen Mercedes along the A272. This follows the jailing of two men for offences leading up to the death of 'wonderful' Horsham grandmother Rebecca Nevins. Click here to read the full story. The video shows the pursuit of teenager Isaac McFadyen who was driving a stolen Mercedes on November 10 last year. 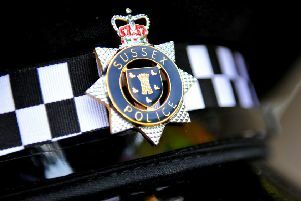 He had entered Sussex, together with co-defendant Conor Dobson, 23, with the intention of stealing cars, a court heard. It was used as evidence at Hove Crown Court on Monday in order to show Judge Jeremy Gold QC the scale of their offending. Prosecutor Dale Sullivan told the court how McFadyen and Dobson were spotted at the Texaco garage at Buck Barn services and a police pursuit started at 2.20pm. Dobson evaded his pursuers and was later involved in the crash which killed Rebecca. McFadyen, however, crashed in West Grinstead as the film shows. He was not involved in the fatal collision. He was arrested trying to run from the scene, the court heard. The prosecutor added: “When arrested he was out of breath and had a few cuts to his face. Sentencing him, Judge Gold noted McFadyen’s youth, but said the burglaries were ‘professional criminal activity’. He was sentenced to 26 months in a young offenders' institution and fined a total of £700. He had pleaded guilty to receiving stolen goods and dangerous driving at Hove Crown Court. Earlier, at magistrates’ court, he had admitted two counts of burglary, driving without a licence or insurance.